The award-winning SQUAREMINO® board game is a fun, educational and strategic abstract board game for 2-4 players that uses a unique set of domino-like tiles. Players take turns adding sets and sequences to a boardless public network of tiles, attempting to be the first to play all of their tiles. Players of various skill levels can all enjoy this board game as more casual gamers will enjoy a relaxing social experience and more advanced players will enjoy exploring complex strategies. The game play is a blend of competition and cooperation as players pursue individual goals while jointly building upon a common structure. The generously-sized and hand-painted game tiles feel delightful to the touch and are pleasing to the ear as they are shuffled together. As the game play progresses, beautiful patterns of colors emerge, creating an elegant work of art by game’s end. 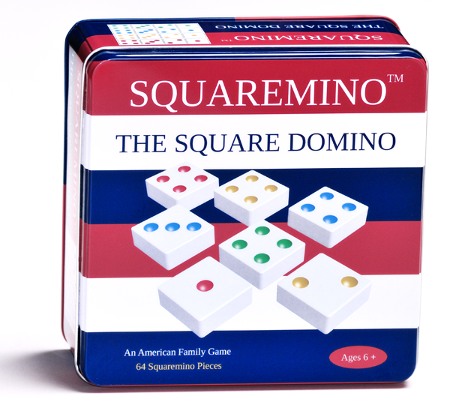 Squaremino is perfect for family game night and school classroom. Especially, it is a great learning tool for children, which enhances children’s cognitive, analytical, and strategic mindset and skills through playing.